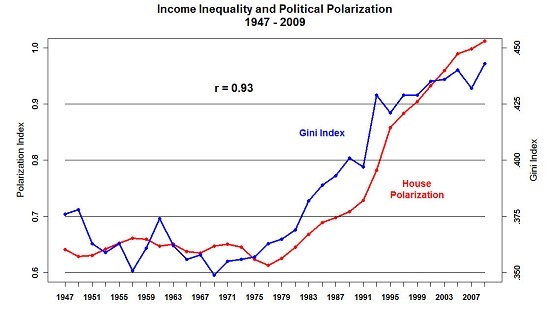 I am late on this analysis, but I spent some time on the weekend reading, and re-reading Powell’s Jackson Hole speech. Contrary to the market’s interpretation, I concluded that his speech was not as dovish as the market thinks. There is much at stake for equity investors. 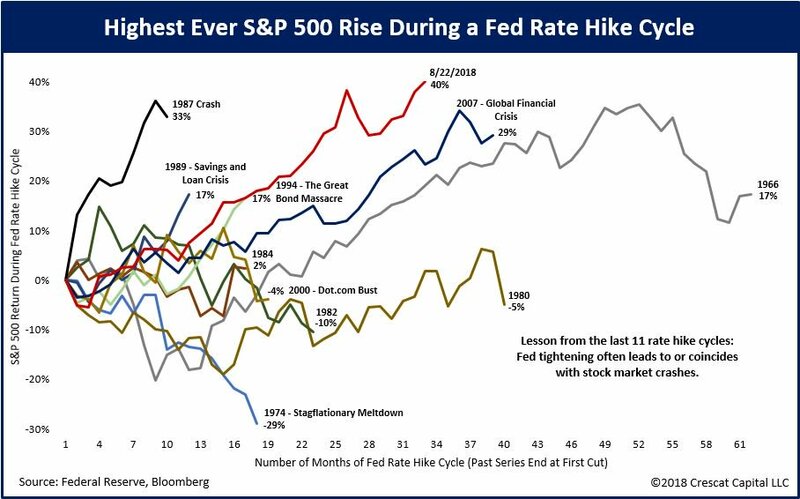 The stock market is already risen to its highest level compared to past Fed rate hike cycles. At first glance, the speech appeared to be dovish. Powell outlined how the FOMC mis-judged the stars. namely the natural unemployment rate, the neutral real Fed Funds rate, and, to a lesser extent, the inflation objective. In doing so, the Fed made a number of policy errors in the past. The FOMC thus avoided the Great-Inflation-era mistake of overemphasizing imprecise estimates of the stars. Under Chairman Greenspan’s leadership, the Committee converged on a risk-management strategy that can be distilled into a simple request: Let’s wait one more meeting; if there are clearer signs of inflation, we will commence tightening. Meeting after meeting, the Committee held off on rate increases while believing that signs of rising inflation would soon appear. And meeting after meeting, inflation gradually declined. As the economy has strengthened, the FOMC has gradually raised the federal funds rate from its crisis-era low near zero toward more normal levels. We are also allowing our securities holdings–assets acquired to support the economy during the deep recession and the long recovery–to decline gradually as these securities are paid off. I will explain today why the Committee’s consensus view is that this gradual process of normalization remains appropriate. 1. With the unemployment rate well below estimates of its longer-term normal level, why isn’t the FOMC tightening monetary policy more sharply to head off overheating and inflation? 2. With no clear sign of an inflation problem, why is the FOMC tightening policy at all, at the risk of choking off job growth and continued expansion? Powell’s predecessor Janet Yellen was a labor economist by training, and she had a deep abiding faith in the Phillips Curve in the formulation of policy. It is evident from Powell’s speech that he has less trust in the Fed’s models and estimates of the stars, namely u* as the natural rate of unemployment, r* as the neutral real rate of interest, and Π* (“pi star”) is the inflation objective. The risks from misperceiving the stars also now play a prominent role in the FOMC’s deliberations. A paper by Federal Reserve Board staff is a recent example of a range of research that helps FOMC participants visualize and manage these risks. The research reports simulations of the economic outcomes that might result under various policy rules and policymaker misperceptions about the economy. One general finding is that no single, simple approach to monetary policy is likely to be appropriate across a broad range of plausible scenarios. More concretely, simulations like these inform our risk management by assessing the likelihood that misperception would lead to adverse outcomes, such as inflation falling below zero or rising above 5 percent. When choosing a strategy for monetary policy, policymakers must grapple with mismeasurement of labor market slack, and of the responsiveness of price inflation to that slack. Using stochastic simulations of a small-scale version of the Federal Reserve Board’s principal New Keynesian macroeconomic model, we evaluate representative rule-based policy strategies, paying particular attention to how those strategies interact with initial conditions in the U.S. as they are seen today and with the current outlook. To do this, we construct a current relevant baseline forecast, one that is constructed loosely based on a recent FOMC forecast, and conduct our experiments around that baseline. We find the initial conditions and forecast that policymakers face affect decisions in a material way. 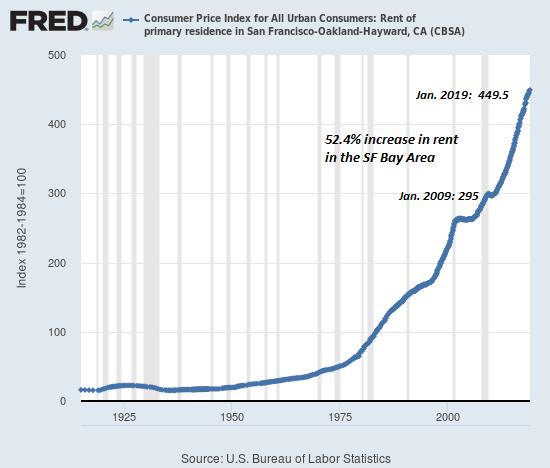 The standard advice from the literature, that in the presence of mismeasurement of resource slack policymakers should substantially reduce the weight attached to those measures in setting the policy rate, and substitute toward a more forceful response to inflation, is overstated. We find that a notable response to the unemployment gap is typically beneficial, even if that gap is mismeasured. Even when the dynamics of inflation are governed by a 1970s-style Phillips curve, meaningful response to resource utilization is likely to turn out to be worthwhile, particularly in environments where resource utilization is thought to be tight to begin with and inflation is close to its target level. In other words, even in the face of uncertainty, the Fed should tighten if unemployment is below r*, or the natural rate of unemployment. That is the first subtlety that many market analysts appear to have missed. Experience has revealed two realities about the relation between inflation and unemployment, and these bear directly on the two questions I started with. First, the stars are sometimes far from where we perceive them to be. In particular, we now know that the level of the unemployment rate relative to our real-time estimate of u* will sometimes be a misleading indicator of the state of the economy or of future inflation. Second, the reverse also seems to be true: Inflation may no longer be the first or best indicator of a tight labor market and rising pressures on resource utilization. Part of the reason inflation sends a weaker signal is undoubtedly the achievement of anchored inflation expectations and the related flattening of the Phillips curve. Whatever the cause, in the run-up to the past two recessions, destabilizing excesses appeared mainly in financial markets rather than in inflation. Thus, risk management suggests looking beyond inflation for signs of excesses. For investors, this means monitoring the breakeven rate and the 5×5 forward inflation expectation rate, both of which have been very stable. If they were to break to the upside, then the FOMC is likely going to stomp on the monetary brakes. 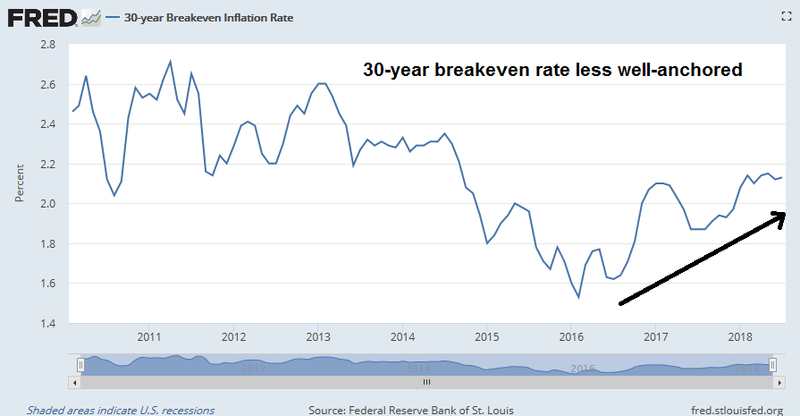 However, the 30-year breakeven rate is rising and less “well-anchored”. Which should you focus on, the 5-year rate, which has been stable, or the 30-year rate, which has been rising? The answer is probably a bit of both, but it is difficult to know how much weight the Fed puts on either metric. When does the Fed pause? Danger lurks, however, in this stage of the business cycle. Due to long and variable lags in monetary policy, activity might not slow sufficiently quickly to deter the Fed from hiking rates. Moreover, they may still be witnessing a lagged impact of higher inflation from prior economic strength. This combination could push the Fed to hold rates higher for longer than is appropriate for the economy. 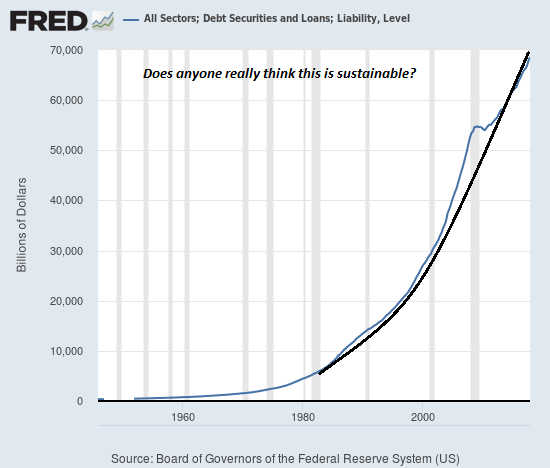 Indeed, this is an error I believe the Bernanke Fed made at the height of its tightening cycle. My sense is that the Fed will resist pausing until the data suggests enough slowing to put the economy on a sustainable path. 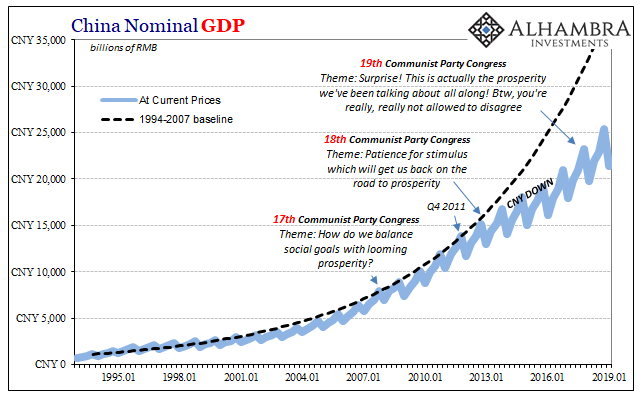 If true, this is where the risk of recession rises as policy transitions from “less accommodative” to “neutral” to “restrictive.” That said, should Powell’s comments at Jackson Hole be relevant for the near-term policy path, I am watching for signals that he is looking to raise policy rates another 50 or 75 basis points into the range of estimates of the neutral rate and then be willing to pause even if the data flow remains strong. This will take of a leap of faith on the part of the Fed that their estimates of neutral are more correct than not and that continuing strong data simply reflects a policy lag. I see the current path of gradually raising interest rates as the FOMC’s approach to taking seriously both of these risks. 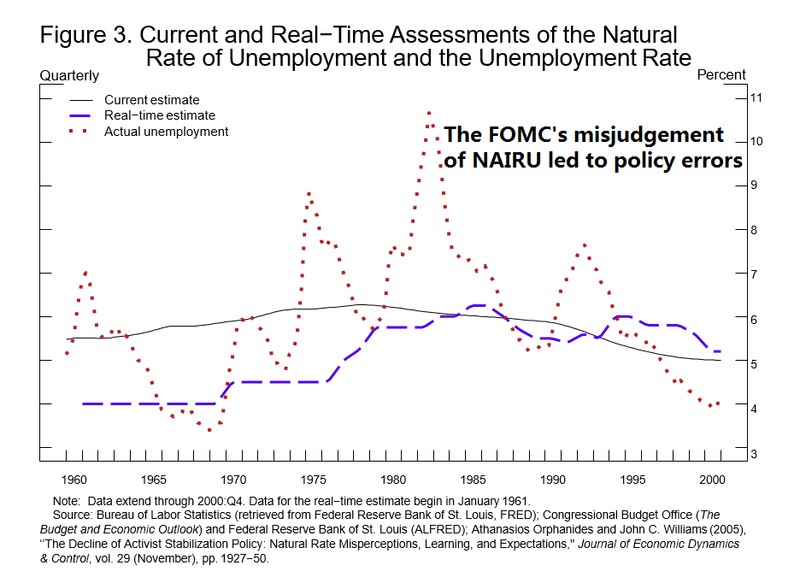 While the unemployment rate is below the Committee’s estimate of the longer-run natural rate, estimates of this rate are quite uncertain. The same is true of estimates of the neutral interest rate. We therefore refer to many indicators when judging the degree of slack in the economy or the degree of accommodation in the current policy stance. We are also aware that, over time, inflation has become much less responsive to changes in resource utilization. While inflation has recently moved up near 2 percent, we have seen no clear sign of an acceleration above 2 percent, and there does not seem to be an elevated risk of overheating. This is good news, and we believe that this good news results in part from the ongoing normalization process, which has moved the stance of policy gradually closer to the FOMC’s rough assessment of neutral as the expansion has continued. As the most recent FOMC statement indicates, if the strong growth in income and jobs continues, further gradual increases in the target range for the federal funds rate will likely be appropriate. The economy is strong. Inflation is near our 2 percent objective, and most people who want a job are finding one. My colleagues and I are carefully monitoring incoming data, and we are setting policy to do what monetary policy can do to support continued growth, a strong labor market, and inflation near 2 percent. In other words, all the considerations of risk management, wait-one-more-meeting Greenspan, and managing policy in the face of uncertain stars were smokescreens. Those discussions related to how the Fed is likely to behave in the face of rising tail-risk. Right now, tail-risk is not evident. The neutral course is to keep raising one-quarter point every three months, and to gradually unwind the balance sheet. In other words, while the Fed is becoming more data dependent and less policy dependent, the preset policy is to keep raising until something breaks. 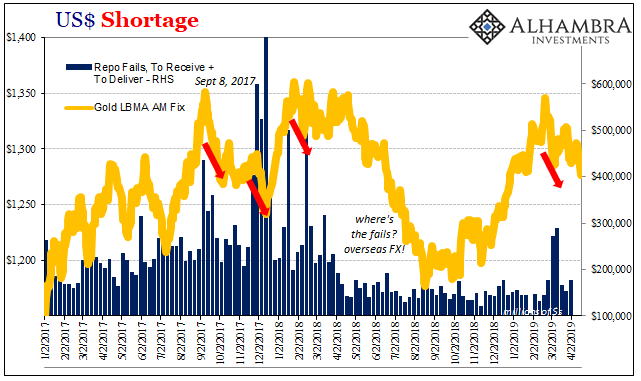 That is why I believe the Powell speech is less dovish that the market consensus – in the absence of substantive Fedspeak discussions of the pausing conditions. Next On the verge of a “good overbought” rally, or market stall?